If a story I read in the New York Times last month is any indication, Honolulu's nightlife scene is attracting a new kind of tourist to paradise. Along with the typical Japanese and Middle American visitor segments, there are reportedly more people in their 20s and 30s making the trip here -- and they've got money to burn. Following a brief closure and approximately $200,000 in renovations, the Halekulani revamped its Lewers Lounge in an effort to appeal to this new type of traveler. Luckily for us locals, we get to take advantage of the secluded watering hole without having to shell out big bucks for a hotel room. THE TIMES said that "travelers are finding a transformed Waikiki, well into the process of morphing from a tacky resort of aging hotels and Elvis impersonators into what is beginning to pass for urban chic." That could also be applied to what's happened at Lewers Lounge, although the Halekulani isn't tacky by any stretch of the imagination. Management faced a dilemma of sorts when it came time to give the room a makeover. There was no way that ADI Design, the company hired to do the work, could completely overhaul the lounge in one of the hotel's oldest structures. At the same time, changes were needed to make it appeal to guests who were making their first trip to the islands instead of their fifth. So the artwork of old Hawaii stayed on the walls, but ADI dressed up unappealing support pillars and added mesh curtains to go with a completely redesigned ceiling. The end result is a destination that retains a familiar feel while boasting a new look that resembles a mainland jazz bar. 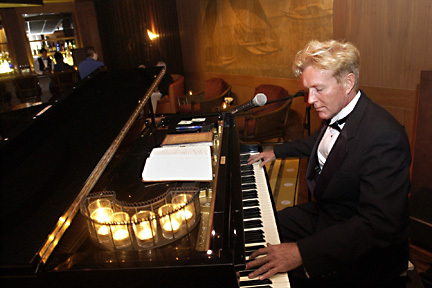 Lewers Lounge, a luxurious piano bar in the Halekulani Hotel in Waikiki, features pianist Timothy Kallen on Thursdays and Fridays. SOFT LIGHTING and votive candles provide a romantic setting here. Hang a right at the entrance, and there are three couches perfect for a drink and some quiet conversation. Near the pillars that have been converted into kahili-inspired couches is the lounge's "stage." This area and the bar itself are the most lively, where conversation and drinks flow freely among an eclectic mix of people from around the world. It seemed like we were the only local residents there besides the hotel employees. That can be a good thing or a bad thing. Good, because you're among people who are on vacation. You can launch into conversation with a stockbroker from New York or a plastic surgeon from Beverly Hills. But not enough locals can be detrimental, especially when the Halekulani offers free valet parking with validation. Why leave this place to tourists when it costs nothing but the price of drinks to patronize it? THE BEST time to visit Lewers Lounge is when director of beverage arts Dale DeGroff is in town. Formerly a bartender at New York City's famed Rainbow Room, he's responsible for the revamped cocktail menu. To give you an idea about how serious DeGroff is about making drinks, consider this: After ranting about the quality of ice served behind the bar, he got the hotel (at considerable expense) to replace the ice machine. Instead of measly chips that quickly melt in a drink, guests are now served blocks of ice the likes of which I've never seen at another bar on this rock. You've got to see this stuff to believe it. Although the price of drinks might keep you from visiting very often, the experience of drinking at Lewers Lounge is fairly unique among establishments in Waikiki. Keep this place in mind if you're looking for an intimate getaway with that special someone or want a change of pace before heading to "Wonderlounge" at the W Honolulu, "Feng Shui" at the Hyatt Regency or "SKYLiNE" at the Hanohano Room. Be sure to bring that credit card -- a Bud Light will set you back $5.50, and the drinks only get more expensive. Try the International Vodka Showcase ($20), where you get four vodkas from a list of 20. Specialty cocktails like the Ginger Lychee Caiprissima ($9), Blackberry Julep ($9) and Flame of Love ($9.50) are must-tries. Timothy Kallen plays on Thursdays and Fridays, Lenny Keyes and Rocky Holmes on Saturdays, Noly Paa on Mondays and Bruce Hamada and Jim Howard on Tuesdays and Wednesdays. Try the Salmon Gravlax ($13.50), Crispy Lump Crab Rolls ($12.50), or the Kona Coffee Creme Brulee ($8). Maybe it's because I've come to expect hotels like the Halekulani to set the standard for impeccable service, but I was disappointed with the efforts of employees during multiple visits to Lewers Lounge. The wait between drinks was excessive at times, and the cocktails made by regular bartenders just didn't compare to those I'd had when DeGroff was in town. This bar keeps it simple, with a hodgepodge of tables and folding chairs arranged in front of an elevated stage. Beers are just $2.50, and live music is offered on weekends. Irish eyes are always smiling at this downtown watering hole. Keep this place in mind if you're into live music -- there's entertainment here daily. Call for the current lineup. A good alternative to the typical club; VIP table reservations are available for you big ballers. This Saturday is a special pink-themed Spring Break edition of the party. Ratings: 4 mugs -- excellent, I'll be back soon; 3 mugs -- very good, worth another visit; 2 mugs -- average, go for happy hour; 1 mug -- stay home with a six-pack! Barfly appears every Friday in Star-Bulletin Weekend. E-mail Jason Genegabus at jason@starbulletin.com with suggestions of neighborhood bars to visit.